More than 1,200 participants, volunteers, and members of the community came together for a family-friendly day of celebration, exercise, education, awareness, music, food, and family fun at The ALS Association Golden West Chapter’s 14th annual Napa Valley Ride to Defeat ALS and Walk on Saturday, September 22. Together, these dedicated individuals raised more than $920,000 on event day toward a $1 million goal to fund the mission priorities of the Golden West Chapter in care services, advocacy, and research. Held at the California Veterans Home in Yountville, the annual Fall event brings incredible energy and an outpouring of support for those affected by ALS in California and around the world. Many participants said it was the best ride they’ve attended. The weather was a perfect 85 degrees with a slight breeze, the aromas of “the crush” of the fresh wine harvest were in the air, and there was a wide range of route levels, from fun to challenging. 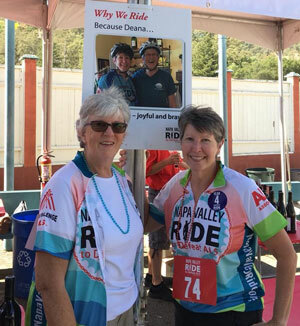 "We had an incredible outpouring of community support this year,” said Kaisha Johnson, Community Outreach Coordinator for the Napa Valley Ride. 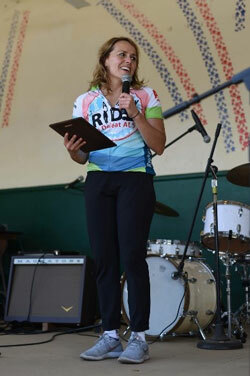 “We had nearly 140 volunteers setting up, checking in our participants, serving food and drinks, supporting rest stops and the six routes, cheering on all of our incredible riders and walkers as they crossed the finish line, and so much more. "We are also very grateful for the support of our many sponsors,"said Cliff Whitlock, Director for Team Challenge ALS, "This includes organizations and corporations like Field, Commercial Caseworks, Guzzardo Partnership, PwC, PUBLIC Bikes and Mike's Bikes, Cytokinetics, IBEW 617, Syar Foundation,Hathaway Dinwiddie, Naked Nutrition, Able Services, Quantum, Mobility Works, and Permobil"
The Napa Valley Ride to Defeat ALS and Walk was one of the first rides created in the country dedicated in support of the ALS community. Started by an all-volunteer committee in 2004, it’s grown into a powerhouse annual outreach event. 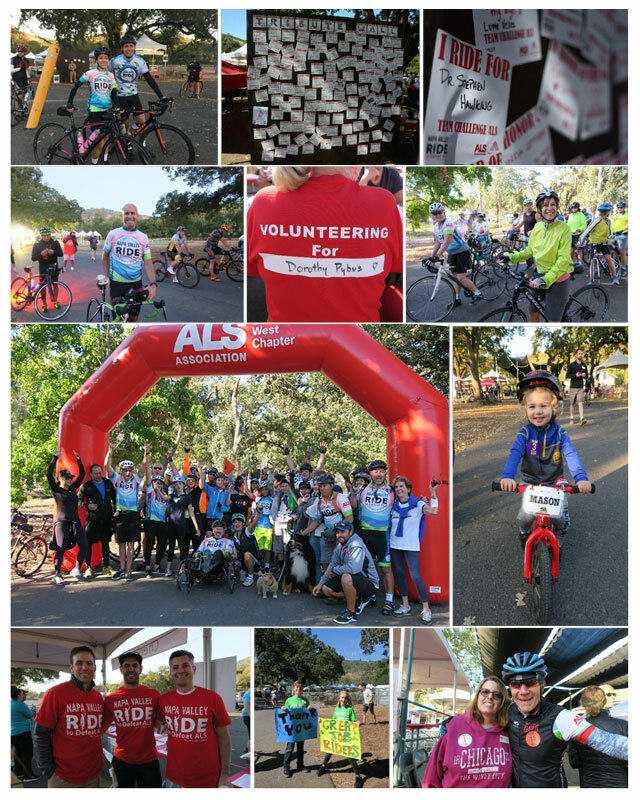 The ride has seen continued increase in participants and fundraising every year since its inception and continues to build momentum in support of the urgent need to fuel The ALS Association’s efforts to create a world without ALS. 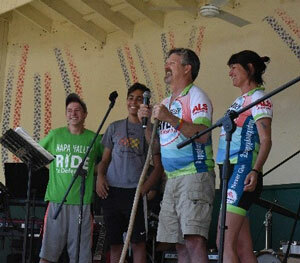 Over the past 14 years, the Napa Valley Ride to Defeat ALS event has raised more than $7.2 million. 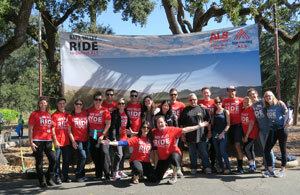 "Bike riding and community is a winning combination,” said Miles McConnell, committee co-chair for the Napa Valley Ride to Defeat ALS and Walk, who has been living with ALS since 2015. “What I personally have come to realize is that, while I’ve lost certain things due to my diagnosis, I’ve also gained things. For example, I now have a deeper appreciation of working toward a goal that is beyond yourself or your little family circle. Karen Walker, committee co-chair for the Ride and board member for the Golden West Chapter, said, “We’re all here because we want to end ALS. I’m personally here because my mom, Josephine, who fought ALS for four years and passed away at 59, spent her entire life taking care of other people. 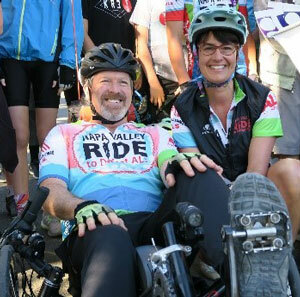 "In 2014, our lives turned on its axis as my spouse Jan and I heard the words ‘Deana, you have ALS,’ shared Reverend Dr. Deana Reed, of Napa. “Our days were at first filled with fear, questions, and tears as we moved toward the opening of a new chapter for us. In the four years that have followed, we have been grateful for the slow progression of the disease and the outpouring of support from all around our ever widening circle of friends, family, colleagues, and acquaintances here in our beautiful Napa Valley. Their presence reminds me of the hope that surrounds life. In his closing remarks during the event’s program, Miles McConnell said, “Thank you for being here. You all act as a support group for people with ALS. That support equates to strength, and that strength is a critical ingredient in dealing with a life with ALS, both for the person with the disease and their loved ones. To few more photos, please visit our album on Flickr.